78/365(+1), a photo by Luca Rossini on Flickr. Whoever got married knows how hard it is to organize a wedding. Those who married abroad, or whose spouse is from a foreigner country, know how crazy can the organization get when it comes to moving family members and friends from all around the world. Or to manage the coexistence of different cultural approaches to weddings. Take this couple, for example. She’s from the States. He’s Italian. They were planning a big, international wedding in the north of Italy, for which they booked us months ago. Then things must have become too complicated, because they decided to call off the big event and have instead a smaller and intimate wedding. However, they still wanted their portraits taken as “bride and groom”. 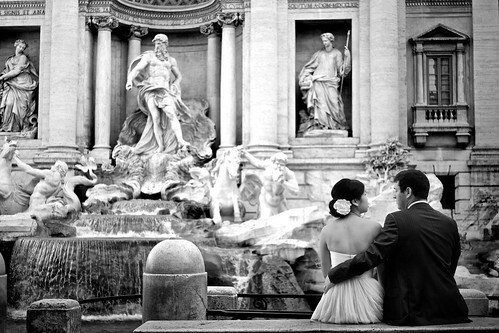 So we planned together a half day photo-shoot in Rome. To avoid the massive crowd of tourists and Romans that every Sunday of spring congests the city center, we met at dawn in front of Fontana di Trevi. The bride was so beautiful. She found a Finnish girl who did a great job with her hair and make-up at five in the morning. Her dress was extremely elegant, simple and modern. The combination that I like most. After Fontana di Trevi, we moved to Piazza di Spagna, then we walked up the Spanish Steps. From uphill we reached the beautiful park of Villa Borghese, in which we had fun renting a row boat, a couple of rickshaws, and taking pictures between alleys, paths, lawns, and woods. It has been a wonderful experience. I never had so much time to take spouses’ portraits. Weddings are much more of a rush. I usually have not more than half an hour between the ceremony and the reception to take couple portraits, with the spouses worrying about their guests being left alone. Having for once the chance to organize a full photo-shoot, instead, made it possible to shoot some amazing images whilst wondering around and enjoying our time. non vedo l'ora di vedere le foto ! Vittorio – papa' di Andrea. i ragazzi sono entusiasti dell'esperienza che hanno avuto con voi. Forse non tutte le fasi del “matrimonio del secolo” sono andate come volevano loro, ma certamente il vostro photoshoot rimarra' tra i loro ricordi piu' cari.